MCMINUTE: Why didn't Kate McCann answer these 48 QUESTIONS? Arguido questioning of Gerald Patrick McCann, on the 7th of September 2007, at 11 a.m.
Of British nationality, the arguido cannot speak or write Portuguese, therefore an interpreter is present, Armanda Duarte Salbany Russell, chosen by the arguida from a list provided by the Consulate. The arguido’s legal representative, Dr Carlos Pinto de Abreu, is also present. He now possesses arguida status, and the rights and duties that assist him are explained to him, and he is subject to TIR [“termo de identidade e residência”, the lowest coercion measure that is automatically applicable, and consists of stating one’s name and residence]. He fully confirms the contents of the statements that he has previously given to this Police, on two occasions, and has nothing further to add. After being made aware of the facts that befall him, he says that he wishes to make a statement. When asked if on the night of May 1, 2007 he went to have dinner at the Tapas with Kate, he says yes. As usual they would come and check on the children every half hour, usually alternating. They arrived at the Tapas around 20:30, and then went to the apartment every half hour, until they arrived back, at around 23:00, plus or minus 10 minutes. Occasionally one of the others in the group made the check, he does not remember if this happened on the 1st. It is not true that Madeleine had been crying that night for an hour and 15 minutes, because she was not alone all that time. When questioned, he said that on the day they arrived, April 28, they removed two cots that were in their room, and placed them in Madeleine’s room. He is unable to confirm, but it could be possible, that there were 3 cribs, and they asked for one to be removed. It is not true that on a certain day they placed one crib in their room, leaving the other in Madeleine’s room. He does not know what days were scheduled for cleaning the apartment. When questioned, he says that Madeleine usually sleeps well at night. During the first months of her life she had some difficulties sleeping, due to feeding problems. 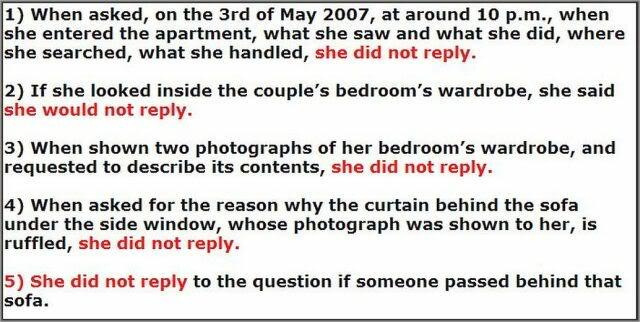 After moving to their house in Rothley in April 2006, twice a week Madeleine woke up, left her bed and went into their room; this sometimes happened between 23:00 – 24:00 for no apparent reason, maybe because she was used to sleeping with (*** blank ****). When asked about a chart highlighting the characteristics of the children, at the house in Rothley, he says that he does in fact have such an object, where several stars show the nights when Madeleine did not get up, as she was rewarded this way. When questioned if it was therefore safe to leave Madeleine in the apartment, given the fact that she woke and got up at night, he says that this rarely happened, and then only after her parents were in bed. When questioned about whether the couple’s and the children’s life was peaceful, namely regarding the work that three children can give a couple, as well as the stress this can cause, he replies that in fact since the birth of the twins their life has been very busy, and that especially during the twins’ first year life was difficult. He states that since the twins were born, he and Kate have gone out in the evening only once, leaving the children with relatives. He adds that in spite of this he never saw Kate depressed as a result of too much work. He denies that Kate changed her work habits for reasons related to depressions. He asserts that his wife never suggested to him that at some time she had the intention of handing Madeleine into the care of a family member. When questioned, he says that he works at the Emergency Room of the hospital where he works every 15 days, however he is not usually called out at night, and if this happens then it is once for 4 days’ prevention. Kate’s specialty is general medicine, but she only works two days a week. After the birth of the twins, Kate did not work for a year, on maternity leave, and currently works part-time as mentioned above. When questioned, he states that none of his children takes any kind of medication regularly in England. When they travelled on holiday to Portugal they brought several medicines, namely Calpol, Nurofen, for fevers and pains, both for adults and children, Losec for gastric problems that he occasionally suffers from, and an anti-histamine called Terfenadine, for hay fever. He did not give any of these medicines or any others to the children while on holiday in Portugal. He remembers that after it was known that Madeleine had disappeared he looked for her all over the apartment. He particularly remembers having looked under all the beds, inside the wardrobes in all the rooms at the same time that Kate told him she had looked everywhere already. He remembers that at one time the lady who lived in the apartment above theirs, went onto her balcony and asked what was going on. He does not remember specifically who replied to this lady, but he remembers that somebody spoke to her, and he admits it could have been himself. When questioned, he states that from the first moment, after the first fruitless searches, he thought that Madeleine had been abducted and it was this information that he gave to everyone to whom he spoke. He reached such a conclusion because he did not think it possible that she had gone out on her own or opened the bedroom shutters and window. When questioned, he says that on that night he made several phone calls, namely to two sisters, a couple of Kate’s uncles, his brother, or certainly sent him a message, father PAUL SEDDON who baptized Madeleine and married the deponent. When questioned, he says he did not get in touch with any media and does not know if anyone did. In the morning his family did contact the press. The deponent spoke of contacting the press, however he never did so. When questioned he says that it was not him who requested a priest, but rather Kate, to seek spiritual help. Regarding the disclosure of Madeleine’s photograph, he says that he gave the authorities a photograph from a digital camera, and he thinks it was Russell who printed it at the main 24-hour resort reception. He made the delivery of this, or those, pictures on A4 paper to this Police, but he is absolutely certain that he never delivered any of these photographs to the GNR. Around 19:00 this interview was interrupted for a rest period, to be recommenced at around 19:40. When questioned if the twins woke up during the searches in the apartment, he replied negatively. When they were taken to another apartment he does not know if they woke, as he did not take them. When asked, he says that this was not normal, but he can find no reason for it happening. Yet, at that moment he thought that the twins might have been drugged by the possible abductor, even if he only mentioned this to the Police several days later. When questioned, he says he never gave his children anything to help them sleep, nor did Kate. When asked why he did not ask the twins what happened to their sister, he says that when the events took place they still did not speak fluently, which they now do, and that such is part of normal development. At that point and at this point he did not ask them because he thought that they would not have the correct perception of what had happened, in addition to thinking that they would have been sleeping. When asked why instead of scouring the land next to the complex they remained inside the apartment, he replies that it did not happen that way. While the guests and resort workers were searching, he went to the main reception to check whether they had called the Police, and told Kate to wait inside the apartment. After returning from the reception he went back into the apartment where he stayed in the living room and in their bedroom. When asked if he has life insurance, he says that he does, and so does Kate. The children do not have any life insurance, nor are their parents, Gerry and Kate, the beneficiaries of any insurance regarding the children. When asked about the contents of the wardrobe in his room that can be seen in the photographs, he says that on top there is a suitcase and below a pile of dirty clothes that he cannot make out. This wardrobe was opened to look for Madeleine. When asked if in fact they went to the apartment every half hour, he says it is true, and that this was never forged to justify absences during dinner. When asked what the expression “we let her down” means, he says that it has to do with the fact that they were not present when Madeleine was abducted. It was Kate who first used this expression. During this interview several films of a forensic nature showing sniffer dogs were shown to him, where they can be seen signalling human cadaver odour and also human traces of blood, and only of a human nature, as well as the comments made by the expert in charge of the procedure. After viewing the films and after the signalling of cadaver odour in their room next to the wardrobe and behind the sofa against the window in the living room, he says that he has no comments, neither has he any explanation for this fact. The dog that detects human blood signalled human blood behind the sofa mentioned above, as well, he says that he cannot explain this fact. Regarding the signalling of cadaver odour in the vehicle that was rented in late May, license plate 49-DA-27, he says he cannot explain more than what he already has. Regarding the signalling of human blood in the boot of the same vehicle, he says that he has no explanation for this fact. When confronted with the fact that Madeleine’s DNA was collected from behind the sofa and in the boot of the vehicle, and analyzed by a British laboratory, situations that had already been described before, he says that he cannot explain. When asked if on any occasion Madeleine was injured, he says that he has no comments. When questioned, he said that he is the usual driver of the car. In addition to the deponent, the car was also driven by his wife Kate, his sister in law Sandy, and a cousin of Kate’s by the name of Michael. When asked if he has anything to add, he said that he has not seen any proof that his daughter Madeleine is dead, and therefore he will continue to search for her in the hope she is alive. He knows nothing more than what has been said. The defence lawyer said that he wishes the arguido to be asked again if Madeleine bled. To which he said it was common for Madeleine to have nosebleeds. He says that he doesn’t know if in fact his daughter bled while on holiday in Portugal, because he does not want to be influenced by the news in the Press, regarding the detection of human blood in the apartment where his daughter disappeared. During this interview the arguido was informed of his duty to respect the secrecy of justice, as well as the consequences of not complying with it, stipulated in current law. At around 22:50 the present interview was ended. Reads, confirms, ratifies and signs, as do the defence lawyer and the interpreter. Kate takes after her mum. Hard faced, make up full on in her grief and a total liar! I had to share with you how pleased I was to find the music for this video (whether its everyone's taste or not) It is perfect for the video. With minimum editing it 'fitted' with the comments in the 'song'....'Why don't you answer?' during the questions is obvious but towards the end the comment 'Please say something' was perfect for the one question she did answer and, sadly...the comment 'why do you treat me this way?' happened at the end with a picture of Madeleine. I don't think I could have custom written the song any better. It's one from 1978 by Sting. the music is certainly very apt HideHo, another great video, well done. Brilliant, perfect choice of song - well done! I had a little chuckle to see comments on the music. My post is an example of why I am not 'needy' for acknowlegement on videos. As long as I know that there is an opportunity for them to be viewed thats all I need. I tend to not rely on others ...but if I feel happy or proud of somethng I tell everyone whether they want to hear or not and then, thats it. Once, I followed the directions on a packet of lard to make pastry. It turned out so good that I called everyone I knew They couldn't care less about my pastry but I did! The music for this video was a fluke. I had googled a few phrases into Youtube search ...(at one point I was off watching pageant mums...dpn't ask me how I got there) and this one popped up...just like that. I found it to be amazing and had to share....so no worries about commenting...Tweeting is anothr matter...would really appreciate that and I know a lot of people do...so thank you. 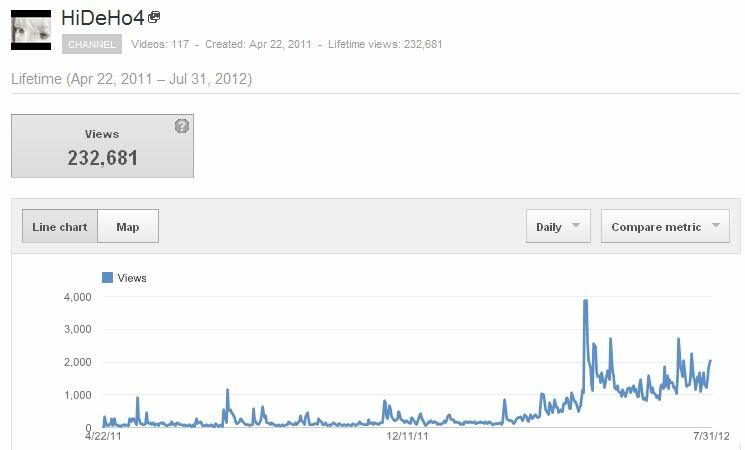 This is what its all about for me...just to watch that little line go up every day. I have had people tell me that my videos made them think differently...so the more that line goes up the more people may start to think for themselves. Eberhard Shoener...is that Sting's name? Just have to say this is one of your best! I agree that the music is just perfect - you are a genius HiDeHo! This is the first time I have read Gerry's Statement , he certainly does not stick up for Kate and makes glaring errors. After moving to their house in Rothley in April 2006, twice a week Madeleine woke up, left her bed and went into their room; this sometimes happened between 23:00 – 24:00 for no apparent reason, maybe because she was used to sleeping with (*** blank ****). I'm just wondering who ***blank****) is, did the person who looked after the twins for the one and a half days sleep in? And how the hec did he check under all the beds, they are down to the floor divans, such simple mistakes Gerry. Will keep a note of that, thanks Bobsy. What I would like to know is why, if they were both interviewed as arguidos, was Kate told NOT to answer and yet Gerry DID answer the questions. I believe Kate was advised not to answer the questions simply because they were what is referred to as "leading questions". Gerry could handle them perhaps better than Kate. If she at any time actually answered a question she may have been in danger of opening up a subject and been "lead" to other areas which, when broached, could have incriminated her.